Poor Aylesbury. My town by adoption has not been treated well by generations of planners. The Sixties were the beginning of the problems, when winding streets were bulldozed to make way for the retail monstrosity of Friars Square. Once used for the filming of A Clockwork Orange, the shopping centre has since been modified several times, but it remains a soulless place, and almost as vile as the high rise monolith of County Hall, which dominates the skyline, dwarfing historic St Mary’s Church and visible almost twenty miles away. Quite how Tory councillors (the County has always been Conservative) who supposedly act as guardians for the best of British could ever have sanctioned such a building continues to puzzle me. It was an auger of things to come. Waterstone’s expanded, perhaps too fast, and it was the big baddie of book selling, trampling over the net price agreement and gobbling up rivals Dillons and Ottakers. Dear Sir Tim was no longer running the show. Shops became increasingly standardised. By all accounts, books were delivered by the pallet or shelf load from a centralised distribution hub and staff merely removed the brown paper wrapping. The apostrophe was dropped and Waterstone’s became Waterstones. Friars Square (typical other shops: River Island, Superdrug, BHS) was just the right location for that sort of bookshop. And, really, there was no need to ever set foot in most branches of Waterstones. Amazon – then in its infancy, with an uncluttered interface (how things change!) and actually focused on books – was better. Then the bosses at Waterstones realised they’d made a mistake. That the reason people went to bookshops was because they were different. That they didn’t want to get the same books in every town. That the reason Waterstones was in a mess was that it had forgotten all of the things which it had stood for at the start. With all that in mind, Aylesbury’s Waterstones is probably best described as ‘getting better’. It might not be the flashiest of places, but the sign outside, which has still to be updated (a.k.a. ‘dumbed down’), preserves the apostrophe! The staff are helpful and at least seem interested in customers. It’s attractively laid out, the fiction ranges from the popular to the literary and most subjects, particularly travel writing and History, are well covered. Arty cards and Moleskin notebooks are to be had, and there’s a large stock of Young Adult fiction (in my days ‘teenage’) but it’s somewhat narrow: apart from Robert Muchamore and the formulaic Hunger Games trilogy, it’s hard to find a book which doesn’t involve horror or the supernatural. Equally predictable is the ‘Mind, Body, Spirit’ offering (who honestly reads such tripe?) and the dire religious section: like most booksellers, Waterstones seems to have no idea about what believers actually read. Yet for everything from a sportsman’s ghost-written autobiography to a classic of English fiction, the chances are Waterstones will have it. And however much our little town is maligned (not least by me), we Aylesburians have much of which we should be proud. While other towns are almost bookshop-less (such as Watford where Waterstones closed just before Christmas), Aylesbury still has a store to meet most needs, a decently stocked WH Smith and a bohemian Oxfam for bargains. We might well crave better, but compare what’s on offer with the mega mall in Milton Keynes (pathetic Waterstones for the size of the city) and maybe we’re doing not too badly after all. 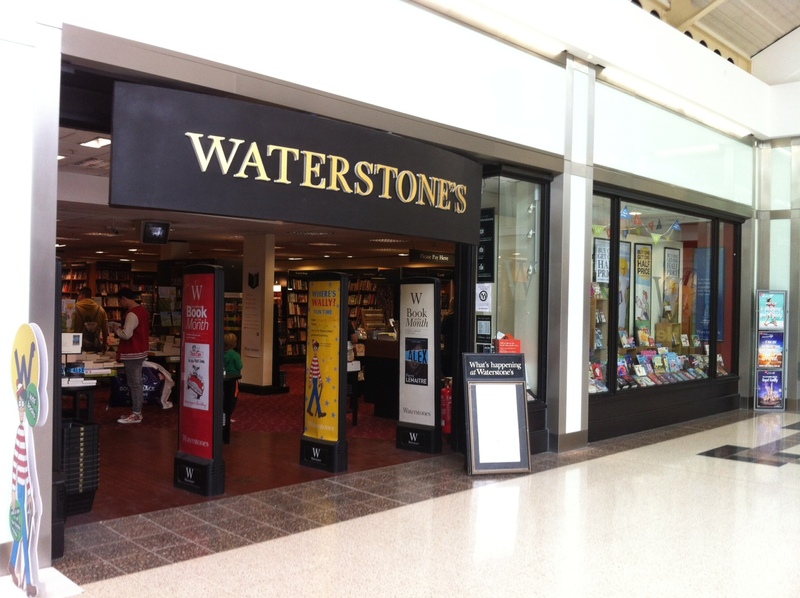 Waterstones is in Friars Square, tucked in beside House of Fraser. There are regular book signing events, usually involving local or children’s authors.